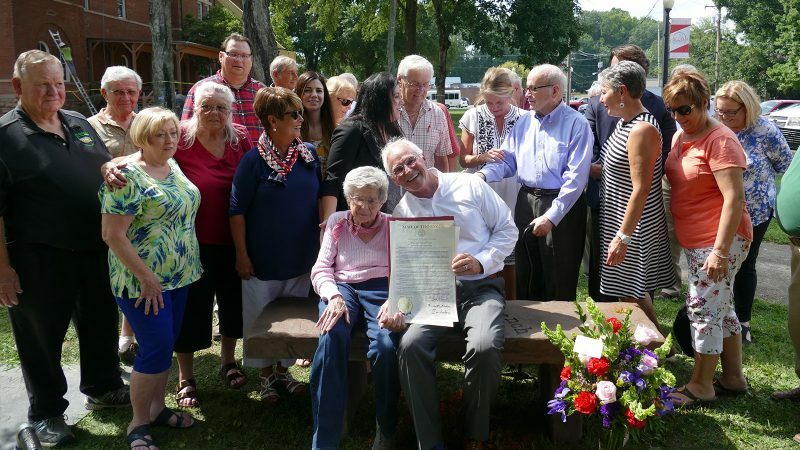 Dayton, TN — On Thursday afternoon, Gladys Best, the Rhea County Register of Deeds, who is retiring in September was honored on the Dayton Courthouse Lawn with a Tennessee House Joint Resolution honoring her for her 56 years of service. Gladys was also honored with a bench in her honor on the courthouse lawn given by the Rhea County Republican Party. On hand were many friends and family as well as state officials. Resolution 1133 was signed by the speaker of the House Beth Harwell, Speaker of the Senate Randy McNally and the Governor Bill Haslam as well as Representative Ron Travis, who made the presentation. Also on hand for the presentation was Rhea County Executive George Thacker.